Tell us a little more about your obsession with soccer. 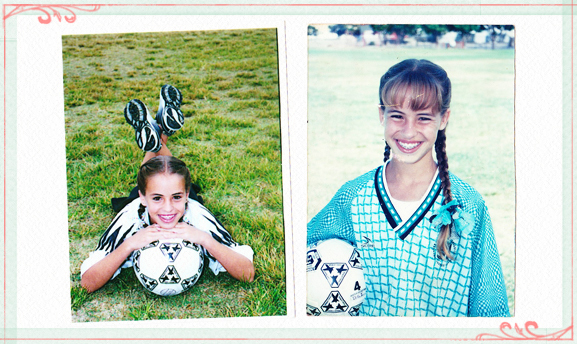 Being the youngest out of three siblings, I always tried to be just like my older sisters and I started playing soccer when I was four. Then I simply began to live and breath it -- my parents even threatened me that I would have to miss practice when I got in trouble. I spent many years idolizing Michelle Akers and the US Women's National Team, especially in the 1999 Women's World Cup, and after years of playing, I earned a scholarship to a university where I played for another two years. I continue to love European Soccer and the World Cup, and my Red Devils, of course! When it comes to New Arrivals posts, how do you select the items? The main factors that go into choosing items for a New Arrivals post are the upcoming features, price points, color, and overall style. I like to make sure that there is a great range of items! I take into consideration affordable versus splurge-worthy items, neutrals versus colors, prints versus solids, and a balanced selection of dresses, tops and outerwear, et cetera. I like to think someone can make an entire outfit, or a mini-wardrobe revival, from any post! What do you look forward to at work everyday? I look forward to the problem-solving everyday. Being able to figure out what went wrong, how to fix it, and how to make processes easier on someone else -- that's my favorite part! When someone asks me a question and I have an answer for them, it's such a fulfilling feeling. I also love the people I work with. They make me laugh, which is something you can't find everywhere. I'm most excited to see Ruche grow even more in 2012. The growth and improvements made over the last year have been remarkable, and I can't wait to see where we're at in another year! Puppy Fridays! I love bringing my Maizy into work with me to play with the other poosies (my weird word for dogs) and she loves that it's also Free Lunch Friday that day since there are sometimes drops of yummy food to pick up off the floor. I call her my little wetvac! Tell us a little more about your sweet tooth. Exactly how bad is it? Let’s just say it’s pretty bad when your bosses know you’ve licked a plate of chocolate cake clean... and then they see you do it! How did you enter the world of styling? I guess you can say I started by styling myself. I’ve always been interested in fashion and clothes so that’s what led me to start my fashion and lifestyle blog. I also worked for a magazine and that was my first experience styling for photoshoots and features. It was so much fun to work in such a creative environment and I just knew this was something I wanted to do every day. What's the most rewarding aspect about being a buyer and stylist? I’m so excited for a fresh, new year! This year I want to make more time for reading, travel, friends and family. I also want to craft more, bake more and journal more! We heard you have over 60 items on your wishlist... Is this true? Meet a few more Ruche ladies here! We also have a interviews with Ruche's Co-Founder and VP of Operations!